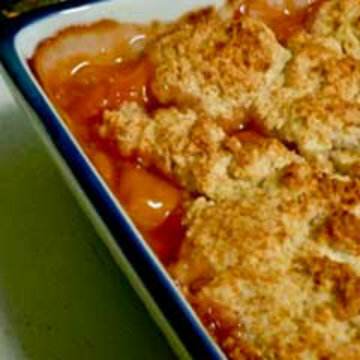 After a big family dinner, nothing finishes off the evening better than warm homemade peach cobbler. Enjoy! This peach cobbler calls for a conventional pastry topping and crust. Unlike a traditional peach pie it is baked in a 9” x 13” pan. Roll 2/3 of the crust into a large rectangle. Place the crust in a 9”X13” pan. The edges should hang over by 2-3 inches. Combine the sliced peaches and lemon juice. Stir in the flour, sugar and cinnamon. You may want to add the lower level of sugar first; the peaches the Sichlers carry are usually very sweet. Use a slotted spoon to place the peach mixture in the unbaked crust. Pour enough of the liquid to come up ¾ way up the peaches (a little more is ok). Reserve the remaining liquid for a topping for peaches and waffles; just simmer it in a heavy saucepan until it thickens. Dot the surface of the peaches with ¾ of the stick of butter. Roll the remaining crust into a smaller rectangle. Place over the center of the peaches. Fold the extended crust over/onto the center crust piece. Dot the surface of the cobbler with the remaining butter. Sprinkle the top of the crust with cinnamon and sugar. Cut several slits in the top of the crust to vent the cobbler. Place the crust in the preheated oven. Reduce the heat to 375° after 10 minutes. Bake the cobbler for an additional 40-50 minutes, until the crust is golden.